Oh my! Time goes so fast. We are already in April! So here are the results for this second session of Whisky Distilleries Tasting. 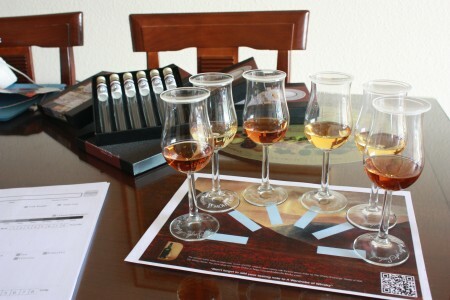 As I explained a blind tasting is a quite interesting experience because tasting whiskies in this way you really pay more attention to the whisky and less to the bottle. I am enjoying so much this kind of tastings that I am starting doing myself them with my samples, keeps your eyes peeled for more info about this soon. Palate (90): powerful, oily. honey, nuts, citrus, resin, spices, wood, leather, cocoa. Finish (89): longer than average. honey, citrus, spices. So based on other whiskies I have already tasted I rate this WTS 2013-02 1 with 89 points over 100. Nose (89): more than average. honey, peat, toffee, citrus, vanilla. Palate (88): powerful, oily. honey, citrus, spices, vanilla, pepper. Finish (88): average. honey, spices. So based on other whiskies I have already tasted I rate this Bunnahabhain 23 Year Old - Single Cask (Master of Malt) with 88 points over 100. Nose (90): more than average. honey, nuts, tropical, fruits, citrus, wood, spices. Very nice nose. Palate (90): smooth, oily. honey, nuts, wood, tobacco, vanilla, floral. Looks like 40%. Maybe a Dalmore? A Macallan? Finish (89): longer than average. nuts, leather, tobacco. So based on other whiskies I have already tasted I rate this WTS 2013-02 3 with 90 points over 100. Nose (89): more than average. toffee, citrus, vanilla, floral. Palate (86): smooth, powerful. honey, sulphur, wood, nuts, spices. Finish (87): average. nuts, spices. So based on other whiskies I have already tasted I rate this WTS 2013-02 4 with 87 points over 100. Nose (87): average. honey, alcohol, citrus, spices, vanilla, floral. Palate (89): powerful, oily. honey, liquorice, citrus, spices, floral. Bottled at high strength. Finish (88): longer than average. floral, liquorice. So based on other whiskies I have already tasted I rate this Auchentoshan 27 Year Old - Single Cask (Master Of Malt) with 88 points over 100. Nose (91): more than average. honey, wood, spices, corn, dust, spices, cinnamon. Palate (89): powerful, oily. honey, citrus, wood, spices, apples, pepper. Finish (88): longer than average. spices, honey, citrus. So based on other whiskies I have already tasted I rate this WTS 2013-02 6 with 89 points over 100. Quite interesting whiskies, my favorite has been the Malt house of Wilson & Morgan.